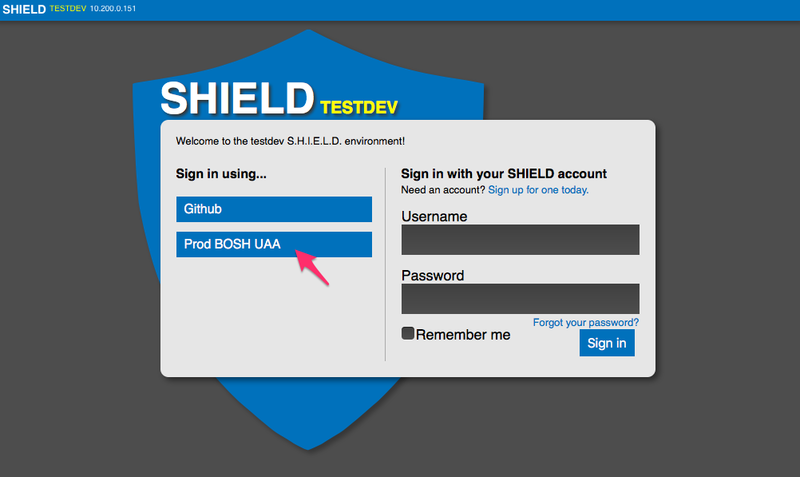 The upcoming release of SHIELD v8 adds support for GitHub and UAA authentication providers. Previous versions of SHIELD only supported basic auth. Many organizations already heavily rely on GitHub and UAA to organize users and permissions within an organization. You will be able to leverage these existing authentication providers to grant access to SHIELD. Multi-tenancy is also being added. A tenant is a single group that defines the context for interaction with resources in a SHIELD configuration. All retention policies, jobs, backup targets, storage endpoints, and archives belong to a single tenant. Each tenant creates and manages its own target and storage configurations, and tenants are prevented from accessing or viewing another tenant's configuration. 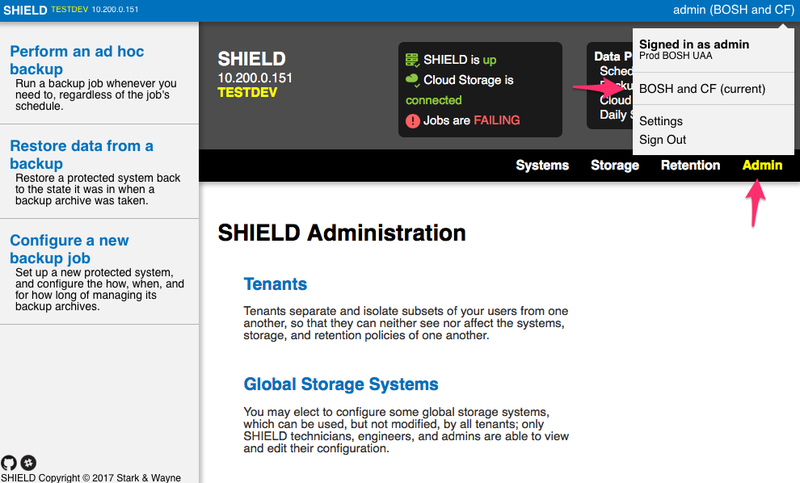 The rest of this blog explores leveraging groups defined in UAA and mapping these groups to tenants in SHIELD. There are many different ways to mapping tenant roles to UAA groups, you are encouraged to understand these roles and map them to your organization as you see fit. Admins are defined in the BOSH deployment manifest's UAA properties to control the cloud-config and platform level maintenance such as deploying BOSH, Cloud Foundry & SHIELD. There are also BOSH Teams defined where members of each of these teams can deploy without having access to the platform deployments or deployments from other BOSH teams. There are three BOSH Teams defined with this sandboxed access: Postgres Team, RabbitMQ Team, and Vault Team. We've identified a number of groups in our organization which have different access requirements to both BOSH and SHIELD. Below we break down how to turn pieces of the use case into configuration points in the BOSH deployment manifest. Now that all the UAA groups have been defined for our use case, the UAA users can be added. UAA users are defined with the usernames and passwords used for authentication. UAA users are associated with one or more UAA groups. To add a user to the Postgres Team, they will need to be placed in their own BOSH team and be able to upload BOSH releases and stemcells. The same needs to be done for the RabbitMQ and Vault team members and is omitted for brevity. Again, replace postgres.admin with a real person's name or identifier. Above, the redirect-uri also contains the name of the UAA instance, called the identifier, which in this example has the value uaa1 which will be needed later in Step 2. The "name" of the client shield-dev and the "secret" s.h.i.e.l.d. will also be needed in Step 2. Now redeploy your BOSH Director so the changes are pushed to the UAA instance on the director. Note that all of this could have been done using uaac commands however if you have multiple environments, having the groups, users, and clients defined in the BOSH manifest makes it easier to repeat this configuration. The passwords are also easily cracked in this example, use more secure passwords or let credhub automatically create them for you. This portion of the configuration is responsible for controlling which authentication providers will be used by SHIELD. This is also where the mapping between UAA Groups, SHIELD Tenants, and Roles are defined. This is done by modifying the deployment manifest for SHIELD. Start with the configuring SHIELD to allow uaa to be one of the authentication providers. At the end of Step 1 we configured a UAA Client for the SHIELD daemon. From this we can extract the client_id, client_secret and identifier. First we will start with the mappings for the BOSH Admin and the Security Admin. There is a special tenant, called the SYSTEM tenant, that exists solely to allow SHIELD site operators to assign system-level rights and roles to UAA group members, based on the same rules as tenant-level role assignment. 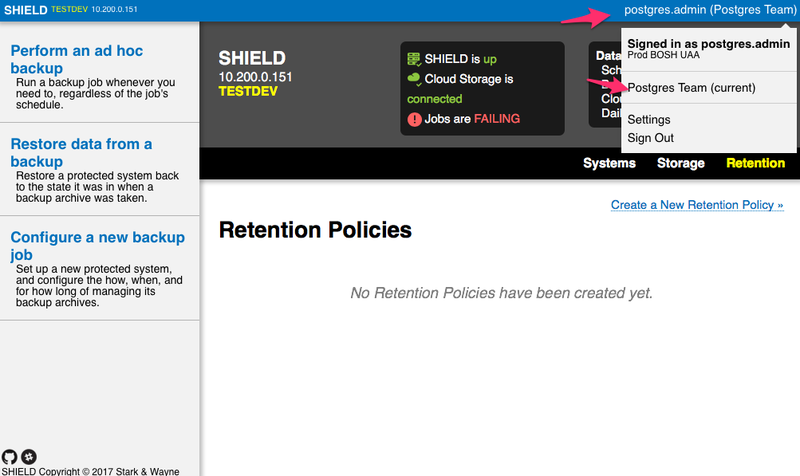 admin - Full control over all of SHIELD. manager - Control over tenants and manual role assigments. engineer - Control over shared resources like global storage definitions and retention policy templates. These rights rules are processed until one matches; subsequent rules are skipped. We'll use the System tenant and map the UAA group BOSH Admins are mapped to SHIELD System Admin role in the use case. We are using both bosh.admin and shield.admin in case there were other users defined as bosh.admin manually through uaac. 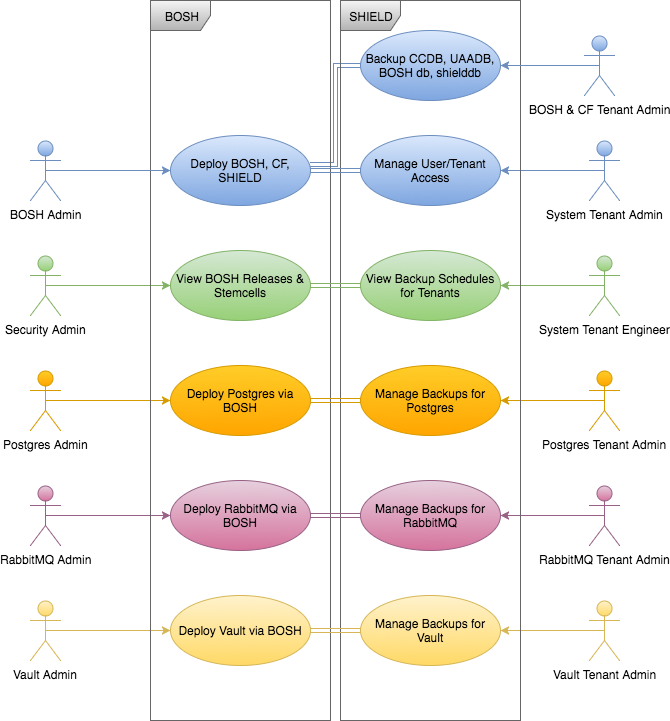 It is also desired to have BOSH Admins control the backups for the BOSH Director database, the SHIELD database, and Cloud Foundry's databases. admin - Full control over the tenant. engineer - Control over the configuration of stores, targets, retention policies, and jobs. operator - Control over running jobs, pausing and unpausing scheduled jobs, and performing restore operations. Now we can map the tenant for the Postgres Admin. The Postgres Admin is identified by the UAA group bosh.teams.postgres.admin and we want this person to have complete control of their backups. Now we can map the tenant for the RabbitMQ Admin. The RabbitMQ Admin is identified by the UAA group bosh.teams.rabbitmq.admin and we want this person to have complete control of their backups. Now we can map the tenant for the Vault Admin. The Vault Admin is identified by the UAA group bosh.teams.vault.admin, and we want this person to have complete control of their backups. The full snippet for the defining the UAA authentication provider and mappings is below. Members of the mapped UAA groups will be able to connect to the SHIELD tenants they are mapped to. Another supported SHIELD Authentication Provider is Github; it also has the concept of mapping. This involves mapping Github orgs to SHIELD tenants and roles. More about this is here. 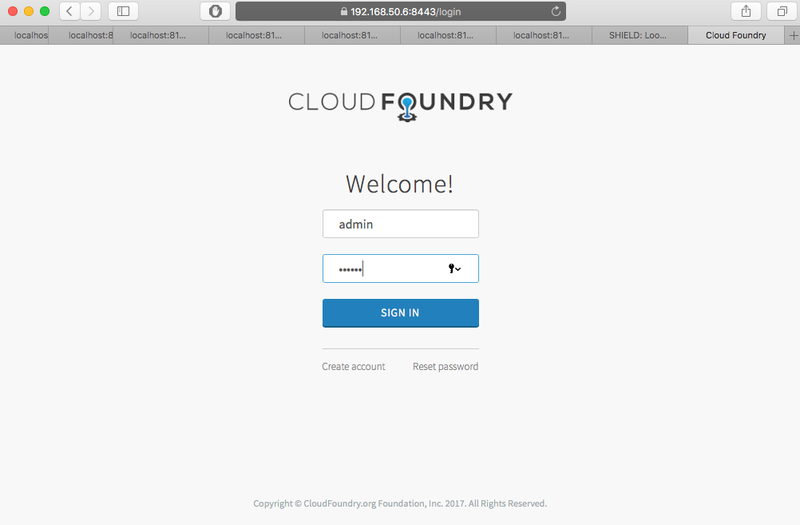 You can also use a stand-alone deployment of UAA, or even the UAA instance that is included in Cloud Foundry. The example in this blog is based on a real world use case where there are BOSH Teams already leveraged to sandbox BOSH access. There are also tenant roles which were not used because each of the teams have a few people all with the same responsibilities to their teams. The additional tenant roles can be used for teams where team members have different roles and responsibilities. Everyone deserves nice things, if there is another use case you would like to discuss, please contact us! There is a Slack channel #help in shieldproject.slack.com or simply reply to this blog post.